One of women’s greatest tools of seduction, high heels create the illusion of slender, longer, and thinner legs. However, heels modify the distribution of the body’s weight from the heel to the bones at the front of the foot. This leads to aches and pains which eventually impede walking or standing for long periods of time. Many women use gel cushions, but these change the foot’s position in the shoe and can cause pressure or friction in other parts of the foot. Ironically, switching to flat shoes can lead to plantar fasciitis. Hyaluronic acid injections allow us to reconstruct and reinforce the plantar cushions, and make high heel pain disappear. This technique is called a ‘Loub Job’, referencing the shoes of Christian Louboutin, and is very fashionable in the USA and Great Britain. This is a safe technique (in the hands of an experienced practitioner) and the recovery time is reduced to the minimum. It is important to select patients. Older women who suffer from arthritis of the foot generally can’t be treated. This is a comfort treatment, it soothes pain, but it doesn’t always entirely eradicate it. The result lasts one year. Ideally, the treatment should be carried out at the first sign of pain to stop further damage to the front-foot cushions. However, the pain can be treated years after it appears. The injection takes place at the clinic. The session starts with a foot examination (I rarely see patients at the chiropodists) to confirm the diagnosis (metatarsalgia caused by wearing high heels) and to eliminate any other cause of pain. I usually apply an anaesthetic cream one hour beforehand, then I administer a local anaesthetic. I bend the toes and identify the position of the metatarsal heads. 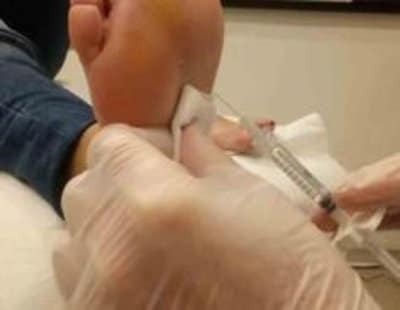 The injection is by cannula, and I inject a minimum of 1ml of hyaluronic acid in each foot. Even if theoretically the patient can put their high heels back on straight away, I ask my patients to wear comfortable sports shoes for 24-48 hours after the treatment. – The sole is a very sensitive area, and it is thus important to know how to make the injection painless (or almost). – The sesamoid bones are under the distal part of the metatarsal heads. When the metatarsal heads are bent (as when high heels are worn), the sesamoid bones support a large part of the body’s weight. The injected product must not move them. 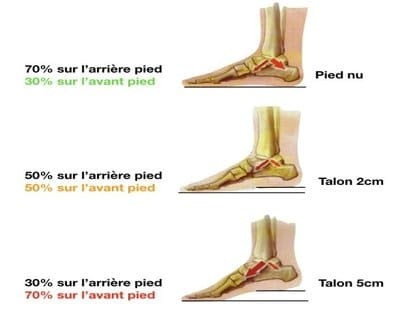 – It is essential to be knowledgeable about the foot’s anatomy, the position of the intrinsic and extrinsic muscles, the vessels and the nerves in order to avoid damaging them. The bruises are rare, a slight swelling can last 24 hours. 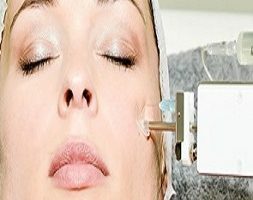 The injection is performed by cannula and an experienced doctor to avoid any serious side effects (muscle or tendon lesions). I’m always wearing heels and have had important pain for a year. Thus, I decided to call upon Doctor Romano to do injections at the level of the foot soles. The result is immediate, I’m delighted! Doctor Romano advised to do injections to alleviate the pain due to the wearing of high heels. They were very efficient and the result was instantaneous. I wear heels all day, my feet were hurting really bad. I have no more discomfort or pain after the injections done by Doctor Romano. Thank you Doctor! I’m in heels all day and could not wear them anymore because of the important pain felt at the level of the foot soles. The injections done by Doctor Romano allowed me to wear high-heeled shoes again with no problem. Thanks!